This is one of few surviving classes since the 70´s in Scandinavia, although it is in an always changing shape. From the 70´s dragsters and altereds with big-block engines to todays turbocharged four to six cylinders doorslammers shows a never-ending developing process in this class. It´s been a while since the class was in operation in Finland, but the cars are still there, or? We have also seen a couple of Norwegian cars the past years, but there are more stored in the garages all over the country. 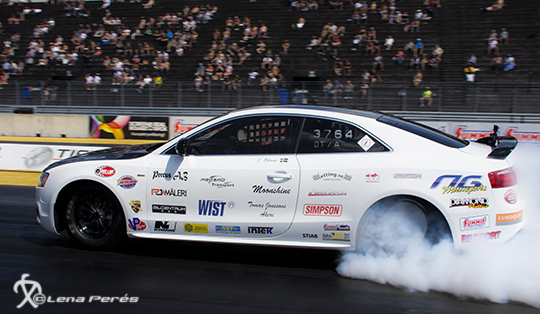 In Sweden, there has always been a lot of cars that could run in the Competition Eliminator class, although they have also competed in other classes. But at the Tierp Arena-events we can see a vast variation of chassis, engine types and power-adders. Yet, outside Tierp Arena, the level of participation in the class has been low, therefore the class will be taken away from the basic series concept of the Summit Racing EDRS-series, putting all efforts into the EDRS Pro concept, which include the four biggest events in the Nordic region; one in Norway, one in Finland and two in Sweden (see calendar below). The king of Comp Eliminator 2018, Jens Eklund, is qualifying almost a second under index. Still the elimination is another thing. Will we see past years champions, Stig Olsson and Daniel Jedborn back in the class? Per Erik Lindgren is building a new car. Krister Adeen, Pär Eriksson and Mathias Stenström are other well-known names in this class. What new names will be added in 2019?